What do you do when you’re having trouble sewing through layers of thick fabric – when the needle just won’t go through the fabric without skipped stitches, stalling, and broken needles? There are three little things that will help harness the penetrating power of your machine so you can stitch through heavy fabrics and multiple layers with ease. The combination of a Jeans needle, BERNINA Jeans Foot #8, and a straight stitch plate results in strong penetrating power that drives the needle through multiple layers of heavy fabric without overly flexing – and breaking – the needle. The answers to more questions like this are in Solving Sewing Challenges, a FREE e-book from BERNINA. 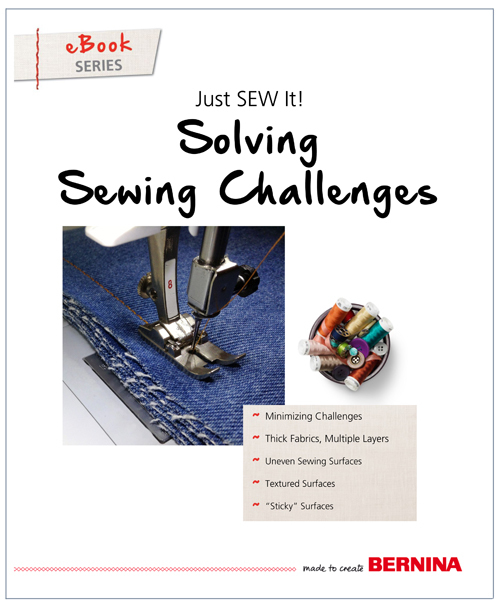 Download it now and watch the Just SEW It webinar by the same name. Click HERE for both of these great resources.